The Ontario government recently introduced sweeping changes to auto accident benefits in all auto insurance policies that renewed on or after June 1, 2016. While the move was introduced to make auto insurance less expensive, there are resultant reductions in coverage that you need to know about. If you want to know what all of the changes were, you can read our previous blog post on it – here we want to focus on the common questions we’re getting from our clients now that the new rules are in effect. 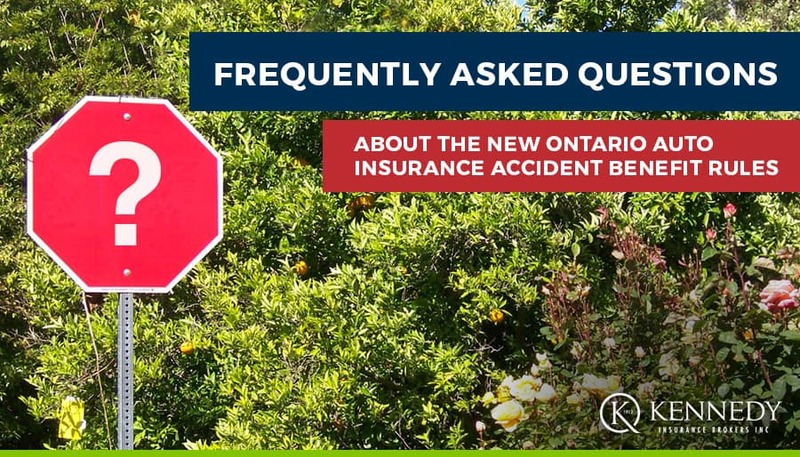 Standard accident benefits included on every Ontario auto insurance policy include a limit for medical, rehabilitation and attendant care. These limits used to total $86,000 for all three, and it has been dropped to $65,000. The amount for catastrophic injuries has gone from $2 million to $1 million. All of these changes leave gaps in coverage that you will want to address. What is classified as a catastrophic injury? A catastrophic injury is classified as an injury that significantly impedes your ability to hold down a job or carry on everyday activities. Examples of this would be a loss of a limb, becoming a paraplegic, or losing the capacity to see. Unfortunately, many injuries that are classified as non-catastrophic injuries can still significantly impair you for an extended period of time – which is why we recommend raising your limits on both catastrophic and non-catastrophic injuries. This is not a way for the insurance companies to make more money – it is to make sure that you have sufficient coverage in the event of an accident, and the premium increases are not that high. How much will it cost for me to get higher limits? This will depend on how high you want to go, but our standard recommendation is for $1 million worth of coverage for non-catastrophic injuries, and $2 million for catastrophic injuries. This premium increase is only around $60 per year, depending on the insurer. This may change depending on your age – if you are younger, for example in your thirties, you would require money for a longer period of time, and you may want to raise your limits further to account for this. I have excellent coverage through work. Wait, do I? Also keep in mind that if you employment status changes you may not have group benefits coverage for a period of time. In the event of a claim, money is paid out by your group benefit insurer first before your auto insurance benefits will kick in. This is really just procedural, but you should be aware of it. If you just want to keep things simple and to make sure you have more coverage, we recommend that you at least increase coverage for catastrophic injuries to $2 million and non-catastrophic injuries to $1 million. Contact us and we’ll be happy to walk you through the process and recommend what is right for you.